Today I have a second sneak peek for the Inspired by Stamping December Stamp Release. I just love this newest set The Sky's the Limit that Joanna has designed. Remember to go by her site because she is having a giveaway and the winner could be YOU. I made today's card using this new stamp set and papers from my little stash o' scraps. I embossed the image in black to make it pop. I also embossed the sentiment. I love the shiny raised look it gives. PaperTrey Ink supplied the fun focal image die. and I added just a few pearls and some ribbon to it to complete the look. Now be sure to look at what all the designers have to show you. I have linked them below for you. Now you MUST come back tomorrow for yet another card and the stamp set reveal. Don't miss it! I'll see you then. great card layout, the added embellishments really make it stand out! This turned out so pretty! Love it! Beauiful card!!! Love the big added bow! Great layout! Beautiful card Susie! 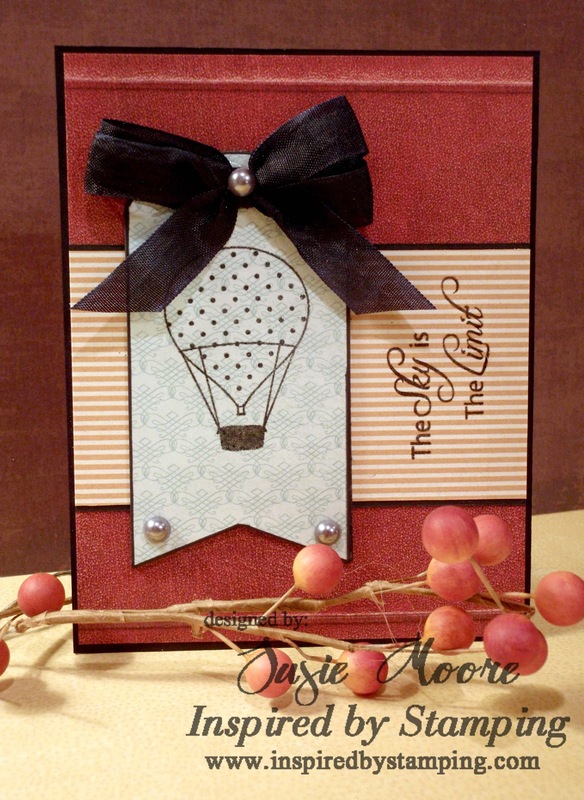 I love how that die fits the balloon stamp! Very beautiful colors too! Cute layout Susie! The colours are lovely too! Gorgeous card!! I love the banner!! Really cute!! beautiful! I love the simplicity of it.